49.051 Flax Tortrix (Cnephasia asseclana) gen.det., one of two reared from pupae found spun up in the garden Marjoram, June 15th 2012. 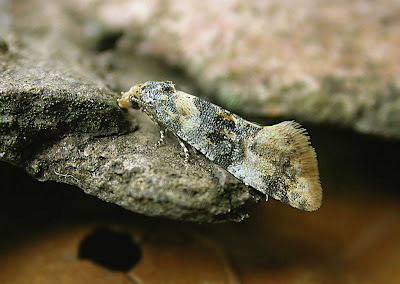 49.059 Green Oak Tortrix, June 11th 2012. 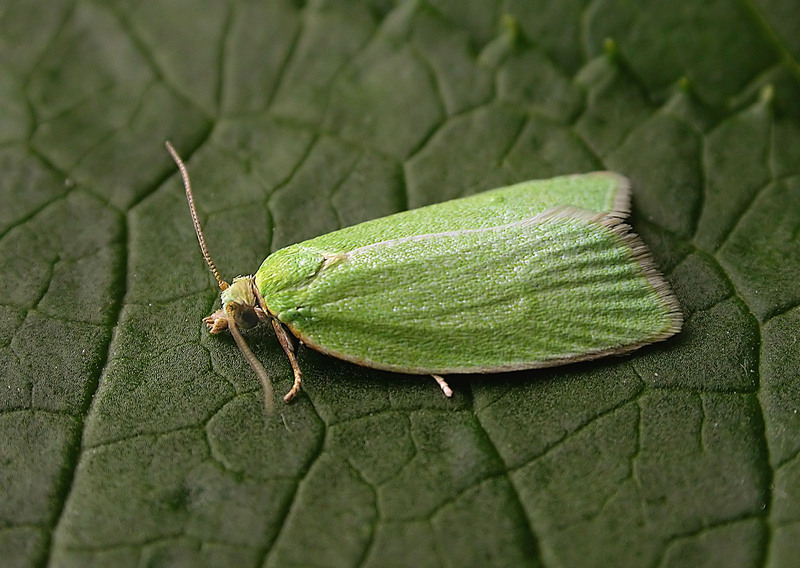 Reared from a pupa found spun up in an oak leaf at North Dean wood on June 1st that year. 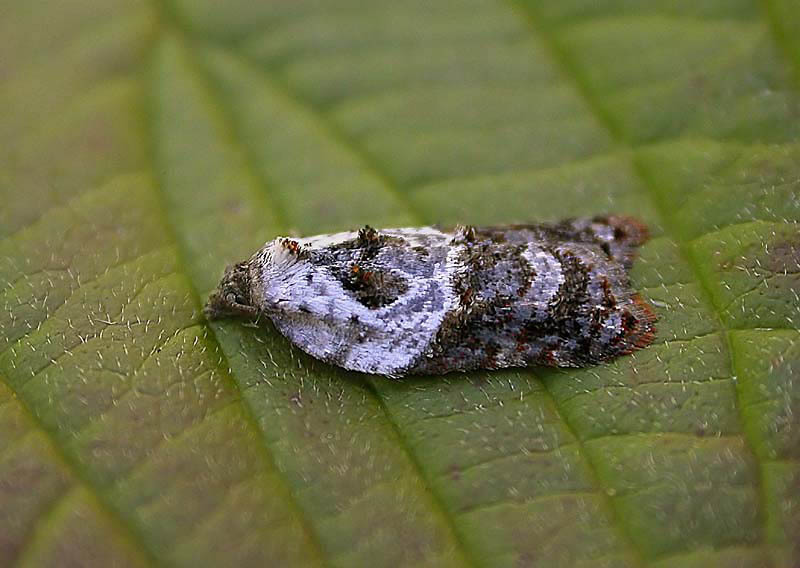 49.062 Maple Button (Acleris forsskaleana). Of three larvae found in folded Field Maple leaves at Tag Loop on May 15th 2014 one was parasitised but the other two were reared through. 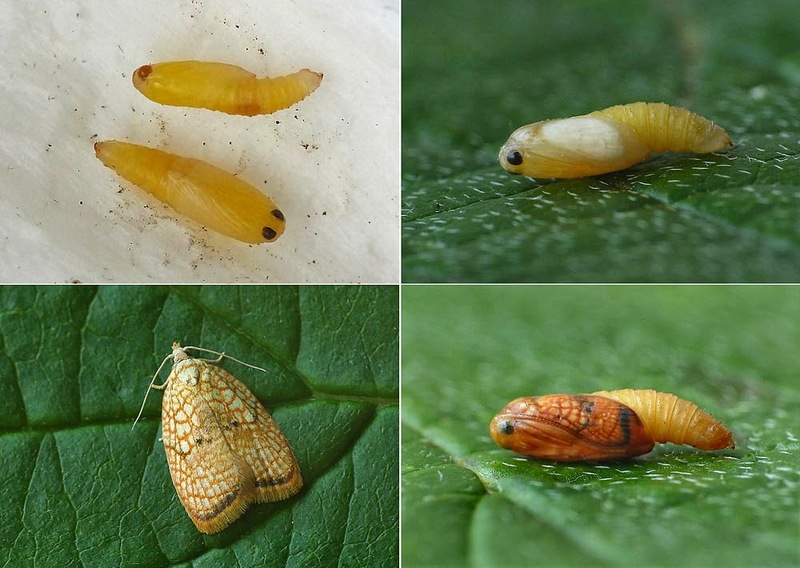 Shown are the pupa(e) on May 29th, June 1st and the coloured up pupa on June 4th, the day before emergence. 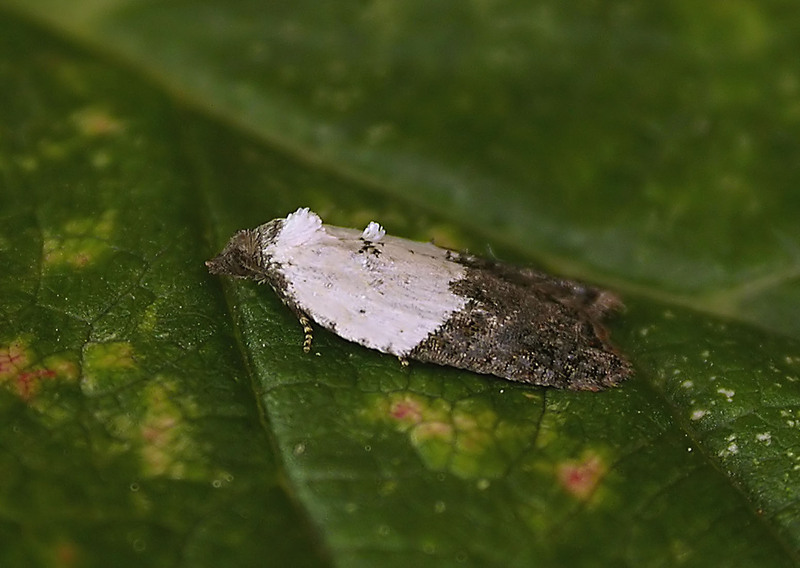 49.062 Maple Button (Acleris forsskaleana), June 7th 2014. 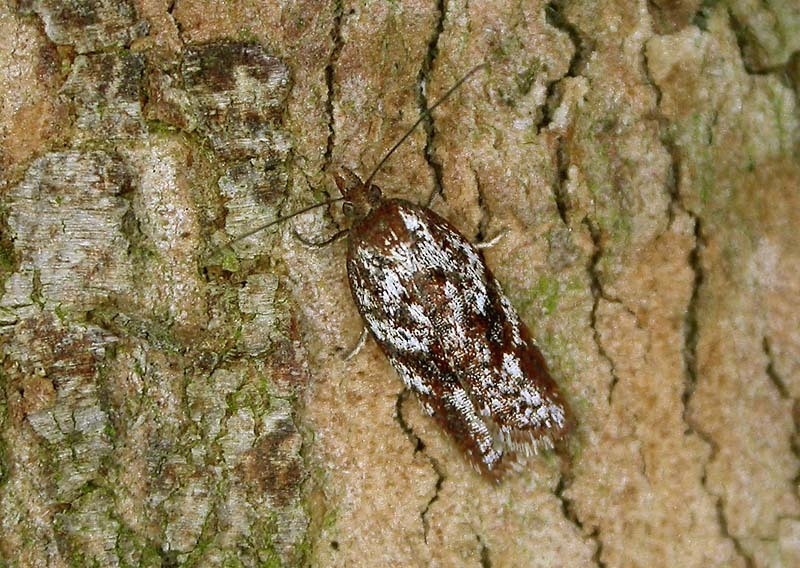 The second moth reared from the pupae pictured above. 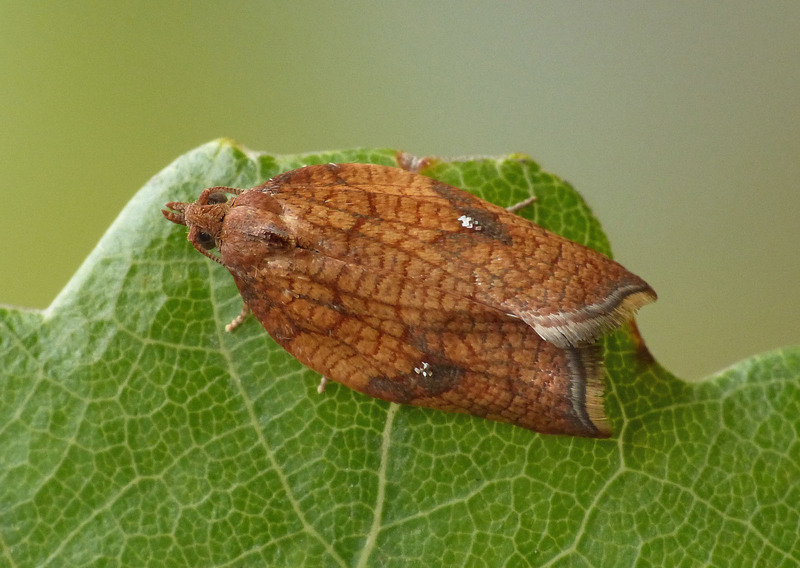 49.064 Caledonian Button (Acleris caledoniana), Norland Bilberry slopes, Aug.8th 09. Netted by day. This Bilberry loving species appeared to be the most common moth at this site in August of that year. 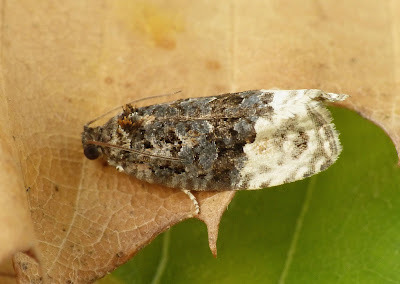 49.066 Dark-triangle Button (Acleris laterana), netted at dusk in Bankhouse wood, Aug. 21st 2010. 49.069 Ashy Button (Acleris sparsana), July 16th 2014. Reared from a larva found spun up on Sycamore in Bankhouse wood earlier in the spring. 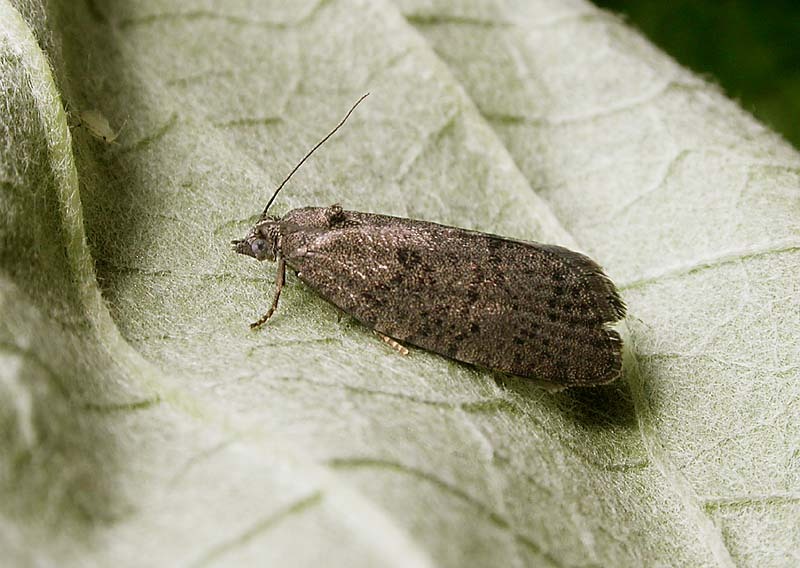 49.070 Rhomboid Tortrix, May 18th 2018. 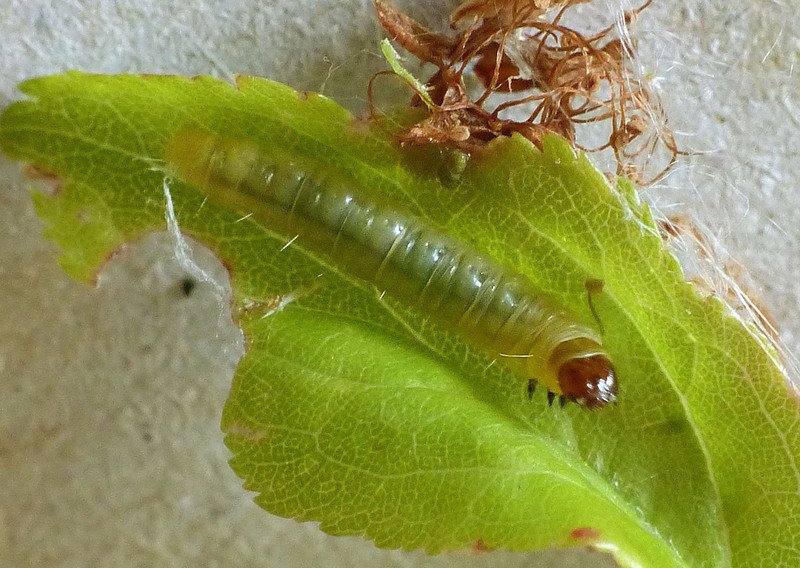 One of six larvae found spun up in Blackthorn leaves at Park Wood Crematorium in May that year. 49.070 Rhomboid Tortrix, Aug. 19th 2018. 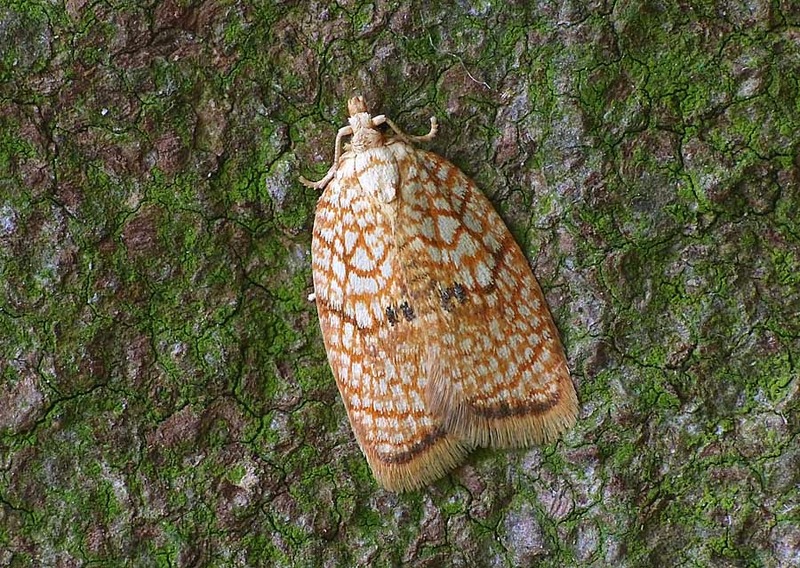 Reared from a larva found spun up in Blackthorn leaves at Park Wood crematorium in May that year. 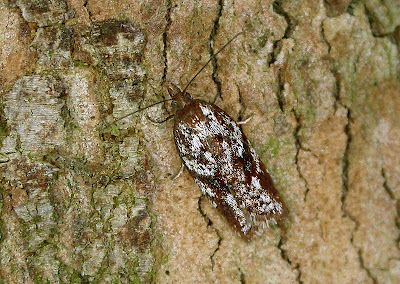 49.071 Notch-winged Button (Acleris emargana), Bankhouse wood, Aug.16th 2010. Netted at dusk. 49.077 Garden Rose Tortrix in the garden, Oct.7th 2012. A field observation on Dogwood. 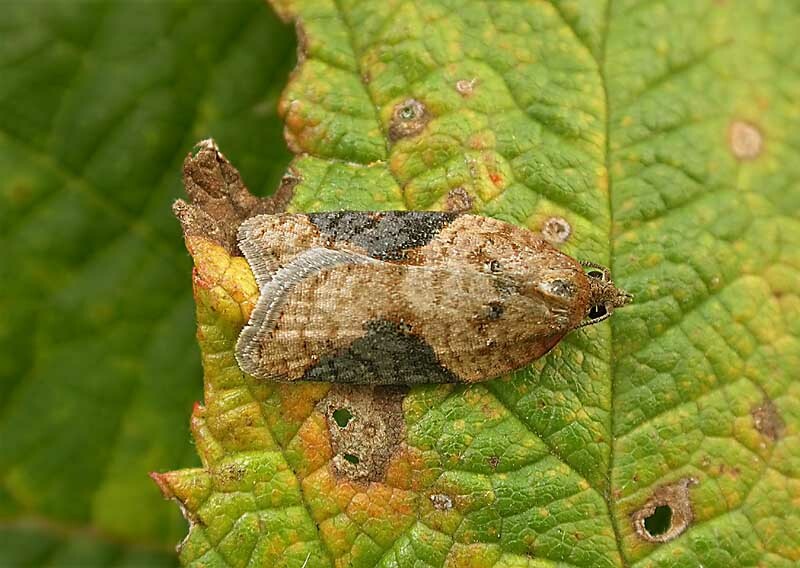 49.077 Garden Rose Tortrix in next door's bramble patch, Sept. 12th 2009. Captured by day. 49.080 Sallow Button (Acleris hastiana) to MV light at Newt Corner, Cromwell Bottom, July 21st 2012. 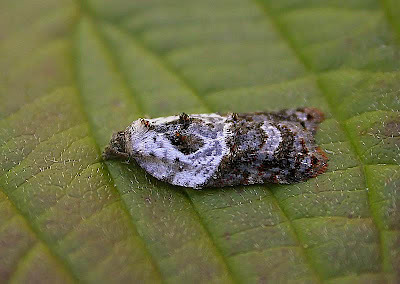 49.082 Heath Button (Acleris hyemana), North Dean wood, Mar.25th 05. Captured by day. 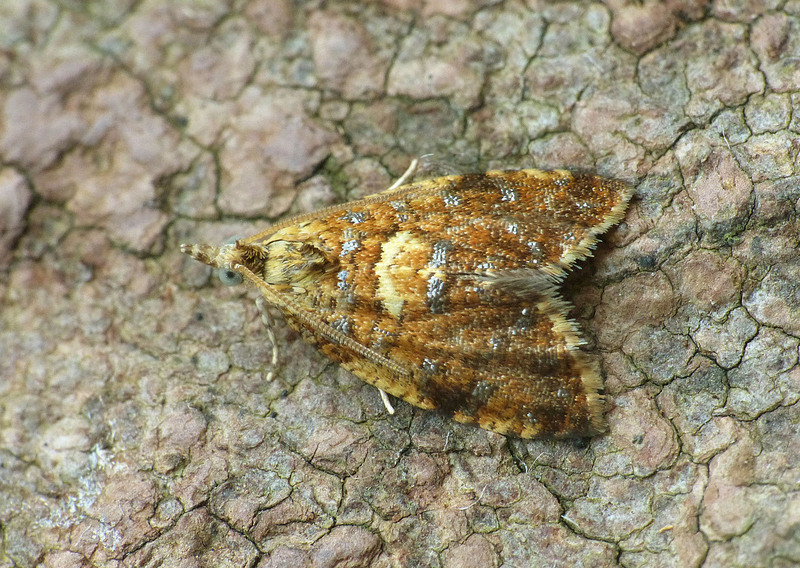 It's in good condition seeing as it emerged last autumn and has since hibernated. It may have originated from the small stands of Heather to be found within the woods although they do seem to wander a fair bit. 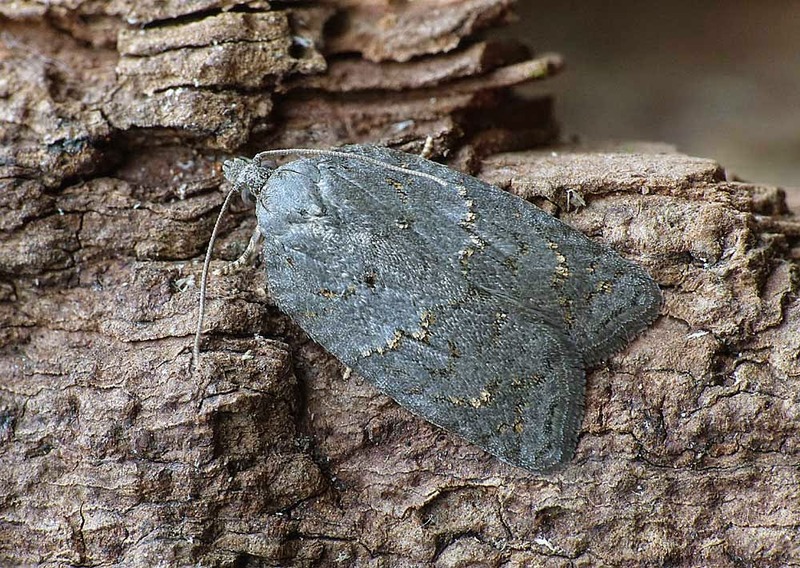 49.086 Grey Birch Button (Acleris logiana) to light at Cromwell Bottom NR, June 30th 2018. Found by the cabin's outside light by Barry Nield and a first for Calderdale. 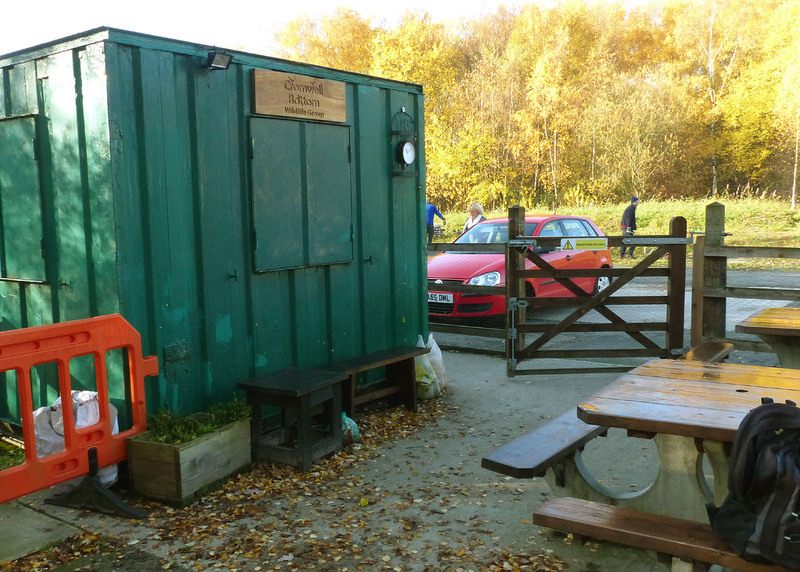 The Cromwell Bottom café area and outside light as mentioned above, Nov. 15th 2018. Sometimes a white sheet is fixed underneath to make locating the moths that little bit easier. 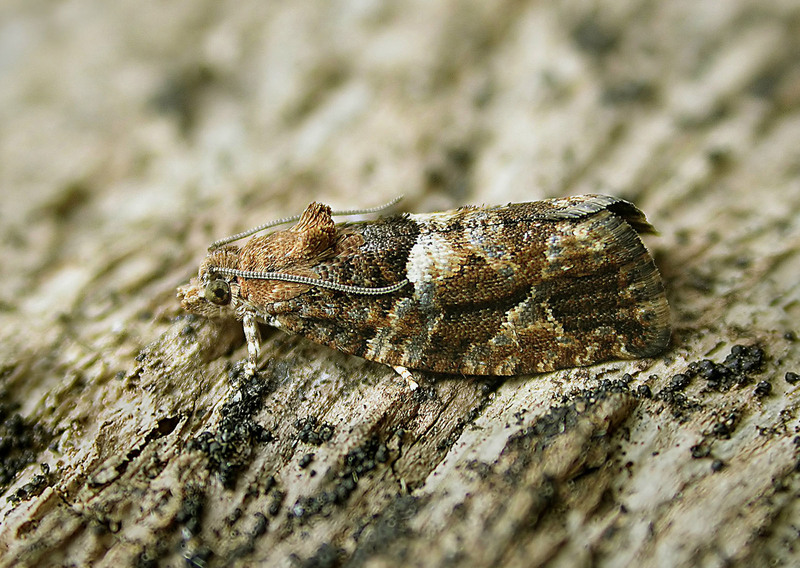 49.091 Yellow-spot Tortrix (Pseudargyratoza conwagana) the garden, July 6th 2017. Captured by day. 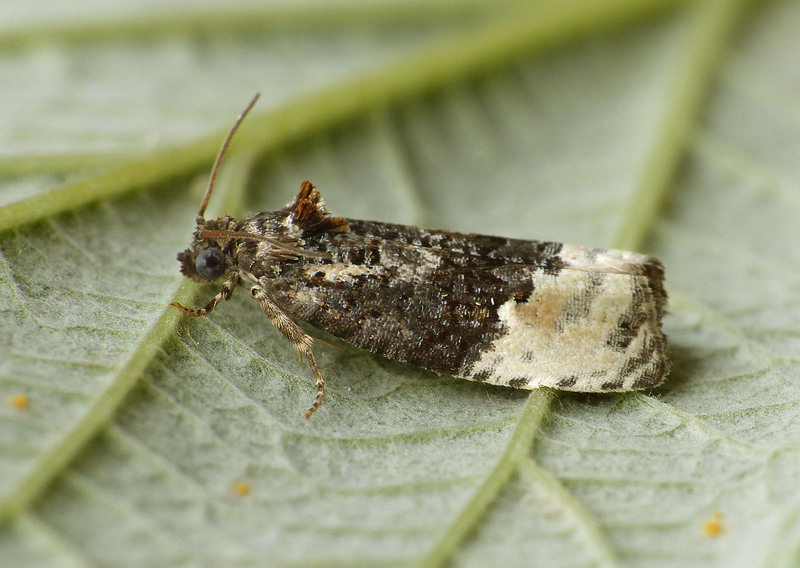 One of the smaller Tortricidae, so much so that the intricate pattern and colours are almost impossible to make out with the naked eye. 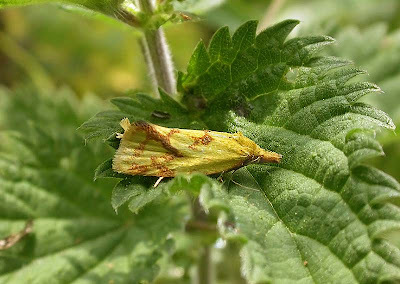 49.109 Common Yellow Conch (Agapeta hamana), the old sewage works at West Vale, June 30th 06. A field observation. I recorded a few individuals at this site during the summer. Probably extinct here now as yet another good site is cleared and levelled by developers! 49.111 Marbled Conch (Eupocelia angustana) disturbed from Heather at Norland moor on Aug.23rd 2017. Captured by day. 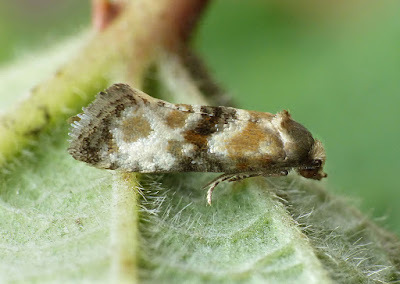 One of just three micros seen that day during a long walk in largely warm sunshine. 49.133 Birch Conch (Cochylis nana) Norlannd Bilberry slopes, Apr.27th 2011. Netted by day. One also seen at North Dean wood on June 10th 09. 139 Black-headed Conch (Cochylis atricapitana) to MV light at the cabin, Cromwell Bottom, July 21st 2018. 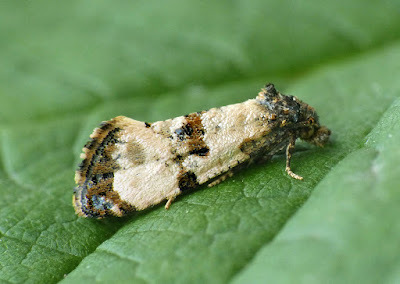 144 Diamond-back Marble (Eudemis profundana), June 28th 2012. One of two reared from larvae spun inside oak leaves at North Dean wood on May 22nd 2012. 49.149 White-shouldered Marble (Apotomis turbidana) to MV light at the Warden's cottage at Hardcastle Crags, July 21st 2017. 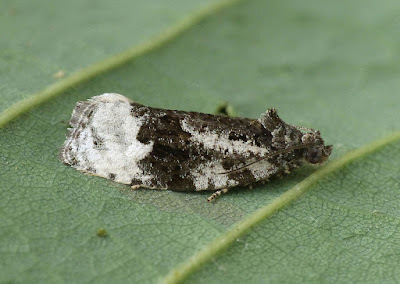 49.149 White-shouldered Marble (Apotomis turbidana) at North Loop, Cromwell Bottom Nature, June 16th 2018. Netted at dusk. 49.150 Birch Marble (Apotomis betuletana) to MV light at the cabin, Cromwell Bottom, Aug. 3rd 2018.